Stock photo of the Esplanade Riel Bridge, a suspension bridge for pedestrians crosses the Red River in the City of Winnipeg, Manitoba, Canada. The Esplanade Riel Bridge, a pedestrian bridge, crossing over the Red River, the City of Winnipeg. 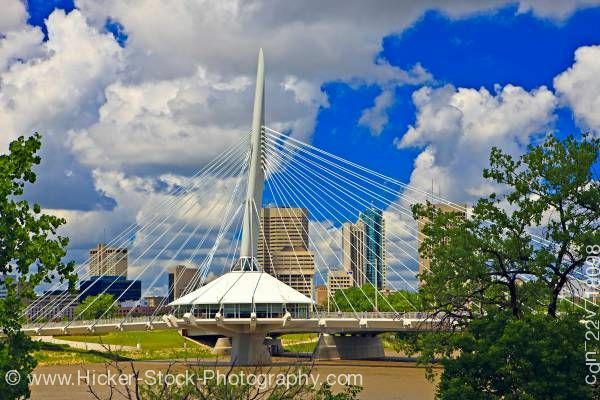 This stock photo shows the Esplanade Riel Bridge, a suspension bridge, specifically for pedestrians, crossing the Red River in the City of Winnipeg, Manitoba, Canada. The architecture of the bridge shows a fan-shaped cable suspension above the circular building as the concrete pedestrian bridge spans the Red River. Cemented columns are underneath the bridge for additional support. The background is the City of Winnipeg with several buildings of various sizes and architecture that add to the setting of the bridge. Adding to the backdrop is a sunny day with a bright blue sky enhanced with big puffy white clouds. The Red River true to it's name is a reddish brown color. Trees are scattered throughout the scenery.